Chris Rock co-writes, produces and stars in this insightful and entertaining documentary about black women’s hair. Really? Can this provide enough material for a feature length documentary? For sure. According to the interviewees every black woman in America, whether it’s celebrities, or regular working class gals, will tell you they spend a fortune on their hair. As a result a very profitable culture of hair has developed in the African-American community. 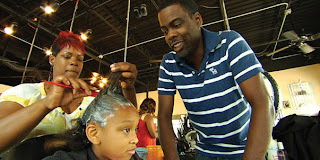 Chris Rock’s documentary sources out the products, personalities and politics of the American-American hair industry. Director Stilson”s camera follows Rock around the world in search of the answers to his questions. How big is this industry? To demonstrate America’s obsession with hair Rock takes us to the annual Hair Styling Battle in Atlanta GA – a garish and corny Super Bowl of black hair stylists. We get to see several of the top performers prepare and execute their lavish broadway style production numbers. It’s all laughably absurd. Rock also discusses the culture of weaves, the elaborate form of wigs – a formerly discreet form of hairstyling which only recently has been publicly talked about by women. The global phenomenon is explored as Rock travels to India to find where the hair from these weaves actually comes from. The contrast between the Hindu ritual of shaving one’s head and where there hair actually goes to and how much it costs is shocking. Ironically, at times Chris Rock himself feels like the crutch of the film. Having to wing most of his gags on the spot with the fly-on-the-wall camera rolling produces many dead jokes. His voiceover (of course, he’s not a professional VO man) feels unncesssary, telling us we already iknow. I wonder how the film would played without Rock in it? Just as good, if not better actually. The strength of the film are the characters Rock introduces us to. The barbershop scenes zing with honest naturalism. Of course, an African American barbershop is historically a place of social congregation. The real honest opinions come out with the effervescence and zeal of a speaker’s corner podium. The topic of hairdos provides an entry point to examine a vibrant culture and style many of us outside of the community only see on sitcoms and movies. Enjoy.